The goal of this research project is to establish an empirically-based modeling framework that can predict how migratory songbirds will respond to environmental change. Of particular interest are grassland birds that may encounter dramatic changes to their breeding and stopover habitats as a result of relatively rapid land use changes. The abundance and distribution of prairies, conservation reserve grasslands, agricultural row-crops, pastures, biofuels, and untilled fields within the American Great Plains will dictate the long-term demographic patterns of grassland bird populations. Songbird migration is a complex phenomenon that results from the aggregate movements of thousands of individuals acting according to their own unique combination of genetically-programmed and learned behaviors. 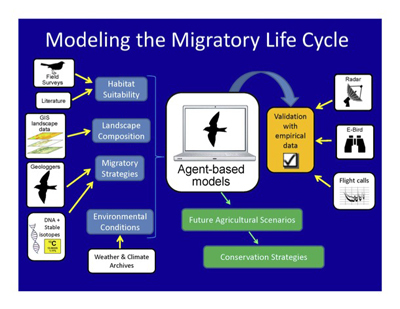 We are simulating this complex system using an Agent-Based Model (ABM) simulation of bird migration built upon real-world landscapes within a GIS computing environment. Agents will move across GIS landscapes according to grassland bird habitat-use parameters drawn from the published literature, breeding ground surveys conducted throughout the southern Great Plains, and geolocator-tracked migratory behaviors of individual adults of six focal grassland birds (Lark Sparrow, Dickcissel, Cassin’s Sparrow, Grasshopper Sparrow, Eastern Meadowlark, and Western Meadowlark). Within the framework of the ABM we are calibrating the “agents” to conform to real-world observations of actual bird movements inferred from Doppler weather radar (i.e., WSR-88D or NEXRAD) and citizen science observation data (e.g., eBird). Following successful calibration, we will modify the underlying simulated landscape [e.g., expanded biofuel cropping; decreased Conservation Reserve Program (CRP) enrollment] and assess how the simulated grassland bird agents may respond to these changes. Our approach ultimately aims to address the demographic impacts of land use changes throughout the entire life cycle of migratory grassland birds. Through the use of ABM we hope to achieve what would otherwise be an extremely time-consuming, costly, spatially extensive, and non-repeatable assessment of the ecological processes associated with migratory grassland bird dynamics.